"It is my belief that the virtuous warrior is the most able to successfully protect and preserve human life. Even someone who lacks the skills and knowledge of how to fight can still protect and be a warrior. Why? Because there is more to protection than just the physical fighting. What causes fights? What leads to conflict in the first place? A lack of virtue. Cowardly, selfish, immoral, and prideful human beings are far more likely to violate someone else’s rights and to inflict violence and evil upon other human beings compared to those who are courageous, selfless, just, and humble. Don’t you agree?" This book is based on 2 and 1/2 years of research and 120 interviews with the most successful leading authorities on human violence and the prevention thereof. The book in my opinion could not be more appropriate and timely. With the Us versus Them mentality running fast and furious throughout both citizenry and with the police ranks, discussion on fortitude, love justice humility, prudence, faith, temperance and all that these virtues underlie and mean to ethical, fair and impartial, procedural just, and what I like to call old school policing. What I love about the book and what makes it different for the other great books The Ethical Protector: Police Ethics, Tactics and Techniques, The Ethical Warrior: Values, Morals and Ethics - For Life, Work and Service, Values for the New Millennium, Tie-Ins For Life: Stories That Teach Great Values and Inspire Moral Action and the Code of the Warrior , Achilles in Vietnam: Combat Trauma and the Undoing of Character and Odysseus in America: Combat Trauma and the Trials of Homecoming is in Alex’s ability to lay out these virtues and show there value in an interconnected way. Not one virtue is more important than the other is the message I took from the book. Instead all of the virtues are of great value as they work together within a person as he interacts with people and his environment. The key is in living and breathing these virtues. As a trainer your goal is to develop problem solvers not checklist followers especially when they are responding to adaptive challenges that require thinking cops dealing with thinking people. We Need Problem Solvers and nurturing these virtues will help in developing just that. “The more you can creatively attack a problem (or bad guy) the more freedom and choices you will discover, which could lead to various solutions. There is a reason “adapt and overcome” is an unofficial slogan of the Marine Corps. However, if you lack prudence, or the ability to judge, how are you supposed to adapt? If you cannot judge or perceive that tactic A is not working, how will you know to adapt to tactic B? Perhaps the best way to enhance your virtue of prudence is simply to spend time around people. Be an active student of human behavior—there is no better way to learn than by doing." In law enforcement there is a pronounced tendency at all levels of law enforcement to control by rules — each problem seems to result in more rules (policies, regulations, directives, etc.) this tendency often creates friction in decision making of an officer. You know friction; that which makes the apparently easy difficult. Those things running through our minds useful or not, that slow decision making down. This is not to say that dealing with people when emotions are high is easy, it certainly is not. In fact, dealing with people in conflict is one of the most unpredictable things we can encounter in life cop or not. To resolve conflict and violence or better yet to help prevent or reduce violence and crime, the virtues we have and are willing to live by brings so much more to the table when it comes to tools in the tool box. Virtues, how we live and treat others matters. It always has matters most especially for police who police a free society. Trust is everything today. As police we have awesome responsibility as we serve others. Strength of Character (Fortitude the author calls it) is a cohesive approach to conducting yourself, interacting with others, and representing the organization. Character is built over time with integrity, credibility and valuing differences. You understand everyone has something to offer that will benefit the organization. The challenges that will build your character are most often complex dilemmas or difficult decisions. When you successfully pass tests of character, you strengthen the bond of mutual trust between your people and the organization. If you fail, those working for you cannot reach their potential or the outcomes we seek. It is never too late to build your character. Your people and organization are counting on it. 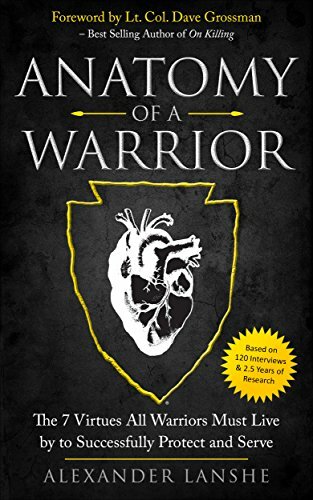 I highly recommend and every cop and quite frankly every citizen should run out and buy Alexander Lanshe book Anatomy of a Warrior: The 7 Virtues All Warriors Must Live by to Successfully Protect and Serve there is a lot more contained within the pages to read and learn from and apply. Great book Alex and thank you for writing on this topic. Policing needs it and I believe craves it, for sure!